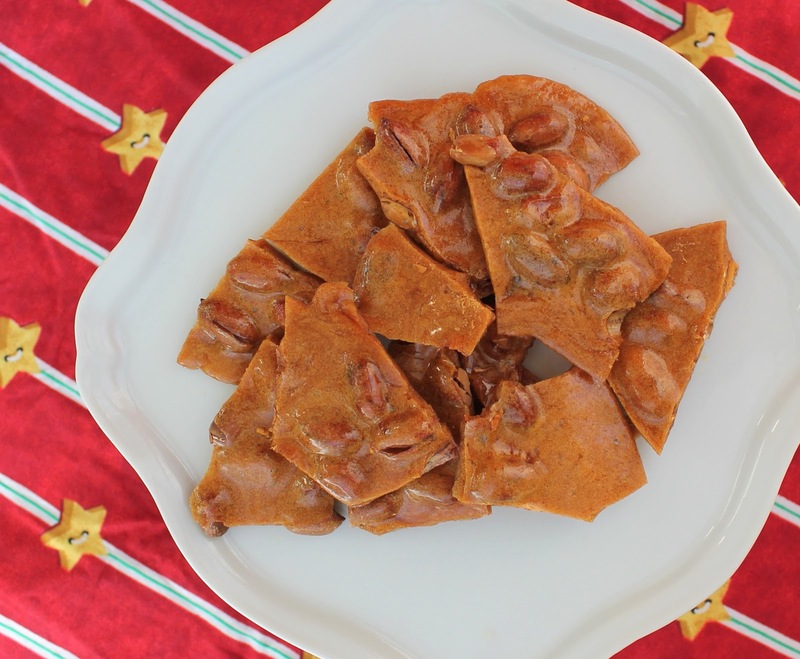 Peanut brittle is a classic homemade gift for the Christmas season. It’s one of those recipes where the ingredients become way greater than the sum of their parts. Who would think that sugar, syrup and peanuts could be transformed into something so divine? Earlier this year, in June to be exact, we drove from Houston to New Iberia, Louisiana to spend a couple of days with my grandmother. She was in a rehab center, working on getting strong enough to go home again, after surgery to repair her broken femur. Just before we left, I called my Aunt Nonnie. What can we bring for Gram? Her answer was all candy: Peanut brittle, licorice and orange slices. Never mind that Gram had been diabetic for years, she loved her sweets. When you reach the ripe old age of 99, screw the diabetes! So, off we went on a candy hunt. My mother, an integral part of the search team, said that she always bought Gram a tin of peanut brittle from Costco, or maybe Sam’s, each Christmas because that’s the only time of the year it was available. I must admit I was shocked. 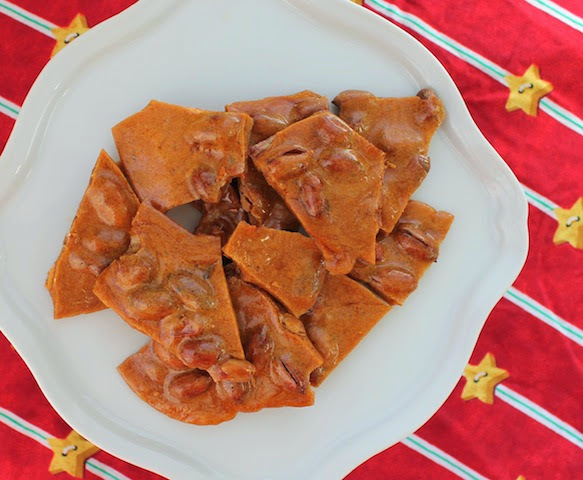 I had no idea that peanut brittle was a Christmas-season-only thing! I guess I’ve lived outside of the US for too long, in places where peanut brittle is never available. Sadly, she was right. We brought Gram orange slices and licorice and substituted something else for the peanut brittle. But I always regretted that I couldn’t find any. As I said to Mom, if I had known ahead, I’d have made some. So, Gram, this batch is for you. I am imagining that your heaven includes a daily supply of peanut brittle but I still wanted to make you some. 2 tablespoons butter plus more for greasing foil. Line a baking pan with foil and then butter the foil liberally. Set aside. Put the sugar, corn syrup, water and salt in a heavy 2-quart pot, and stir until all the sugar is dissolved. Add in the peanuts and stir again. If you have a candy thermometer, attach it to the pot now. Cook over a medium heat, stirring occasionally, until the thermometer reaches 300°F or 149°C or until a small amount dropped into a glass of very cold water turns into hard and brittle threads as it sinks. Remove from heat and stir in the two tablespoons of butter and the baking soda. Pour the now frothy mixture immediate into your prepared pan. My original instructions from Good Housekeeping suggested that I use two forks to stretch and spread the mixture in the pan but I found that jiggling the pan vigorously did the trick. See how it has spread almost to the corners now. When the peanut brittle is cool enough to handle, use your hands to break the brittle into smaller pieces. Share with someone you love. Pin Gram's Favorite Peanut Brittle! My husband would be thrilled if I made this for him. It is one of his all-time favorites. It goes really quickly in this small quantity, Renee. Make the man a pound of candy! I can't decide which I love more, your heartfelt story or the peanut brittle. They are both wonderful. Your comments are always so sweet, Betsy. Thank you! 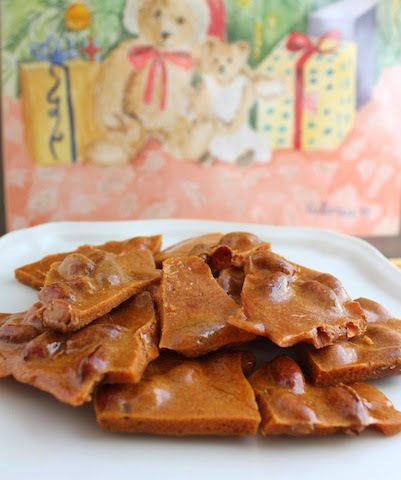 These peanut brittle will be an ideal gift for X'mas and the forthcoming Chinese New Year! Thanks for sharing! I am SO glad that you joined us this week! I have loved all of your recipes. And I'm going to make this for my family! We love peanut brittle! I would make rainbow cupcakes,potato bread,flower shaped peppermint cakes,star shaped mace cookies, and a peppermint pie. Ha, I made peanut brittle for yesterday's post, great minds!!! It is one of my favorite treats!!! This looks absolutely delicious, I'm definitely going to have to try this out!! I LOVE peanut brittle! Everything about it! Ahhh yum! Thanks for sharing! I haven't had a good peanut brittle in years. Loving your version, and I think I'm going to surprise my dad with this for Christmas! He used to make it for us, but doesn't do it any more. He's going to love it! Peanut brittle is one of life's finest pleasures. I love it, can't get enough of it. I am going to put frosting on cupcakes the way they should be done instead of with a Ziploc bag and a pair of scissors! :) Recipe looks delicious - I should make some for my mom!